Wearable glucose monitors will be made available to tens of thousands more people with type 1 diabetes from April 2019, NHS England has announced. Its decision comes after an investigation found patients in some areas of the country were being denied access to the device. It reduces the need for finger-prick blood tests and helps people with diabetes to manage their condition. Diabetes charities called the change of policy a huge step forward. In England, around 300,000 people have type 1 diabetes. The Freestyle Libre flash glucose monitoring system, used by Prime Minister Theresa May, who has the autoimmune condition, was made available on the NHS last November. But recent research suggested only 3-5% of type 1 patients in England had access to the monitors on the NHS, when 20-25% were eligible. This was because some local clinical commissioning groups decided not to prioritise funding of the devices. NHS England said the device would now be funded to allow access throughout the country in all 195 clinical commissioning groups, benefiting a target of about a quarter of people with type 1 diabetes. 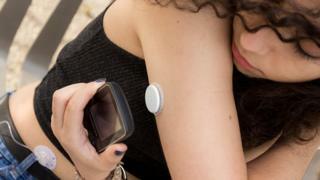 The glucose monitoring device uses a tiny sensor inserted under the skin of the arm which is connected to a small transmitter patch on the surface of the skin. The sensor reads blood sugar levels from fluid just beneath the skin and transmits them wirelessly to a display on a portable reader held near the sensor. The technology reduces the need for finger-prick blood tests and can make it much easier for people with diabetes to manage their condition. BBC journalist Lauren Turner has had type 1 diabetes for 14 years and has tried using a flash glucose monitor. "I've used the Libre and compared to pricking my fingers (which I do about eight to 10 times a day), it's revolutionary," she says. "I'm now waiting to find out when I can get it on prescription. "It doesn't work for everyone - some prefer to use other systems, like continuous glucose monitors. "But for me, what's most helpful is seeing the last eight hours of data, in the form of a graph. "You also get an arrow showing whether your levels are going up or down or staying roughly the same. "That's a world away from just getting a number on your monitor when you finger prick, with no clue as to what the bigger picture is. "I find it more convenient too, as you can scan over the top of clothes - it's like swiping a contactless bank card. "And then there's the fact my poor finger tips, which bear the scars of thousands of pricks from over the years, get a break. "Another surprising benefit is that you can easily spot other people with diabetes - making you feel you're not alone dealing with this lifelong condition." Chris Askew, chief executive of Diabetes UK, said the announcement would be "welcome news to the many thousands of people with type 1 diabetes whose lives will now be changed for the better by access to flash glucose monitoring". Simon Stevens, chief executive of NHS England, said digital health and technology would be at the heart of NHS England's long-term plan. "NHS England is taking important action so that regardless of where you live, if you're a patient with type 1 diabetes you can reap the benefits of this life-improving technology." Karen Addington, chief executive of type 1 diabetes charity JDRF, said: "This should end the inequality of people being refused access to this life-changing type 1 diabetes technology depending on where they happen to live." But she said training should be provided to make sure all healthcare professionals knew how to support people using the device. Health Secretary Matt Hancock said: "Rolling out these monitors will not only make life more convenient, it will save the NHS time and resources by preventing people becoming ill in the first place. "I want to see innovations like these become commonplace in our healthcare system so millions of people across the country stay out of hospital and can get on with their lives."